Just out of curiousity, what is the largest lipo battery (mah) you have used on your AEG? Also what's the highest C rating you've used? I have quite a few RC batteries that are anywhere from 5000mah to 8000mah and 50c to 70c... thinking of a possible mod to my crane stock to support carrying them. This a problem for DUCT TAPE. Lol... looks like someone's been playing too much Fallout. I think the max advisable C rating would be about 35...I don't know much about electrics / batteries in general but I think anything mad like 50-70 would be too much for an airsoft gun? Optimum 'C' rating from what I've heard is 25. The gun will only draw as much current as the resistance of the wiring will allow. That said, it would allow the gun to achieve it's fullest potential just before bursting into flames and taking the soul of his first-bown. I say do it and post the video once he gets out of the burns ward. Lol... it won't burst into flames. C rating is what 'can' be discharged from the battery, not what 'will' be discharged from the battery. The motor/mosfet/controller will only draw what it can/needs. I know. I was doing comedy. Maybe I should change the title... I was looking to see what mods were out there for large battery packs in order to get some ideas. It's a [email protected] trying to find batteries higher than 20C that will fit inside the TM crane stock so was thinking of just using my RC batteries with a modified case or holder attached to the stock. You can get pouches that attach to the stock but they look awful. Yeah, I've seen some and they do look awful. It's the Devgru with crane stock. Not a fan of the standard 416 stock. please note the "lol" on the end of my post and understand my post was in jest (hint: it isn't "loads of love"). The battery will be external but is small enough to fit into a bottom corner of the stock, side saddling the adjustment latch. It sould be barely noticable when I'm finished with it. I know there are some Turnigy airsoft batteries that are listed as 25C-50C but I've never had luck with Turnigy and I don't trust their specs. Be interesting to know how 50C effects the performance. I normally run 20C but after having the spectre installed and the motor upgraded the 20C seems to not be enough. I'm estimating the mosfet and motor pulling about 30amps and my 20C batteries were only able to handle about 20amps constant. When using my larger RC batteries versus my 20C airsoft batteries the difference is very noticeable. ROF and trigger response is quicker. I haven't tried this 2000mah one yet but it should have the same results as the larger RC batteries, being that it can handle three times the amount of amps required. A lot of batteries have very high burst c for quick spooling up of high-torque motors. Can't check the link right now but it may be the case that it can't do a constant 50c. This one is 50C constant. 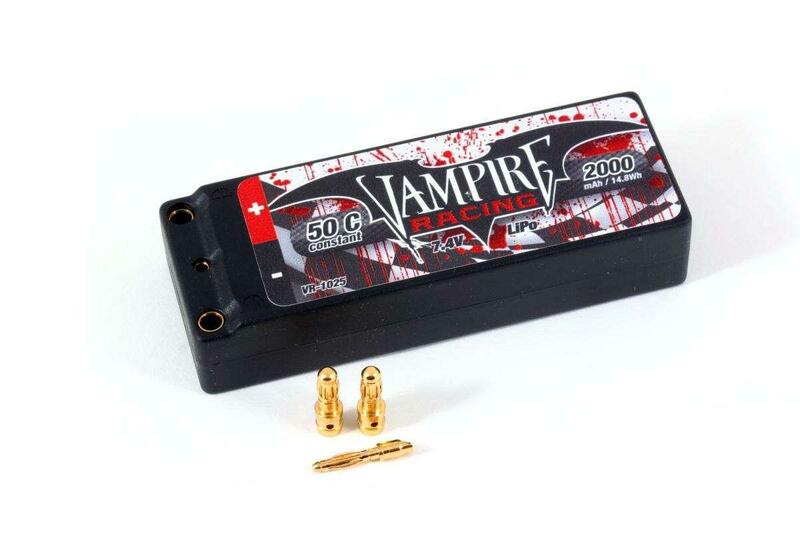 I use a lot of Vampire Racing products for my RC cars and they are very much a performance brand. I have 6 other Vampire batteries and trust the brand as I have used them for years. I just found out over the weekend they made this battery for micro RC cars. It's always good to have a battery rated at least 2 times higer than the amperage you require (at least in RC it is)... especially when running an electronic controller/mosfet. I would think this will benefit airsoft applications as well. 20c will behave itself better. I like zippy compact ones they seem to perform very well and usually are a smidge smaller than turnigy lipo's of same spec. I agree with you on the above, however, I have yet to blow a lipo up :-). I doubt you will experience much difference above 30C as your motor will have a limit of amps it can draw from 7.4v. A good thing you have pointed out is there will be differences with setups, etc. If your gun is stock I would stick with 25C as there is nothing to buffer or smooth the rps and you will most likely get over-run as you have experienced. Most mosfets will brake the motor where needed. Also agree that "25C - 50C" is marketing malarky. Never trusted it and never will. Always go with a "constant" spec rather than a varied one.